There's a new shopping mall in the east, and it's Changi City Point which is just behind the Singapore Expo. Among the many new shops within the mall, there is a new place for us kids to hang out and chill while the adults go about their shopping errands. Located on the second floor, the Petite Park is an indoor playground designed to provide children (that's us!) under 7 years old (or less than 130cm in height) "an imaginative, challenging, and fun yet safe environment to play and explore". Well, at least that was what its website claimed. And with the owners of The Petite Park having invited us down one weekend ago, di-di, mei-mei & I shall attempt to verify that for ourselves. Hee. At first glance, the colourful play structures really caught our eyes. Mei-mei, for one, couldn't wait to get into the playground! Compared to the likes of Amazonia, Polliwogs or Fidgets, the structures are much less intimidating and less challenging. So Daddy reckons it is best suited for kids aged 1 to 5 years old. And if parents just want to observe their young-lings from a distance, they can do so by getting a rest on the bar stools right outside the playground while sipping a kopi or reading a mag. Since it was the Chinese New Year, the playground had organised a free craft workshop as part of the festive celebrations. Naturally, di-di & I jumped at the chance to make our very own angpow dragon! We did our craft work at the Party Room area, where di-di harboured grand plans to hold his Birthday party there. Hahaha... I just told him to quit daydreaming and complete his craft quickly so that we can hit the playground soonest! Because look who had already started without us! Mei-mei was definitely only too eager to get her playtime underway, and one of her favourite play structure was this mini-slide. She, too enjoyed crawling through this bubble tunnel. That's right. With our angpow dragons completed, it was time for some serious play! And what better way to announce our arrival than to create a splash with all those colourful balls in the ball pit. I think mei-mei found it to be a great idea too huh. One can never go wrong with ball pits I say. Well, unless if there are bigger balls around for us to play... like these giant bouncing balloons! I think di-di enjoyed this enclosed area lots, because he was squealing with delight as he tried in vain to wrap his arms around a giant balloon - and accidentally bursting one in the process. Oops. As for my personal favourite, it was the spinning carousel with dangling balls for me to hop onto. But if crazy dizzying fun isn't your cup of tea, you can go slow with the Ship which rocks gently from side to side. And if you really force us to pick our most-est fave of the lot, we would go for this. Obviously it was bouncy enough for us to literally bounce our way down. And amid our crazy shrieks and laughter, mei-mei chose to have her own quiet moment at the Pretend Play area. The area is very well-equipped with lots of play toys for toddlers; from train sets & tables, kitchen toys, make-believe food stalls, to music instruments and educational puzzle toys. Definitely a welcome change from the perspiration-inducing play structures. Which di-di & me were still at it. Right until Daddy & Mummy said it was time to leave. Judging from the perspiration dripping from our heads, I think you would know whether we had enjoyed ourselves. The indoor playground is well-padded and the play structures & toys are clean and sanitized - so Daddy feels it is the perfect place to dump toddlers while the adults go shopping. ESPECIALLY if there is an I.T. fair or Warehouse sale at the Singapore Expo next door! Actually, not that we would mind lah. 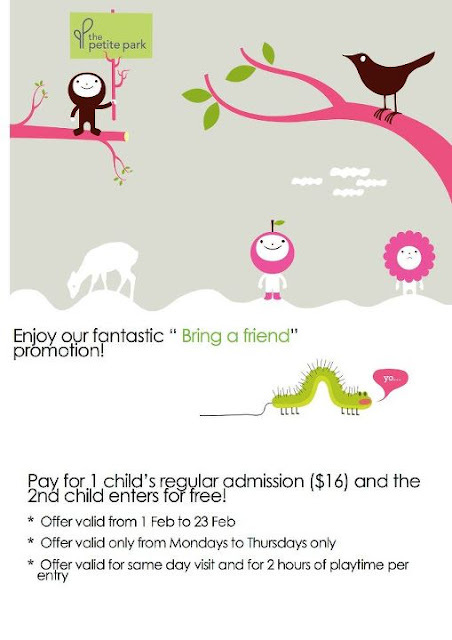 And right now, from 1 to 23 Feb, The Petite Park is having a one-for-one promotion! Details and terms below. Oh, remember to bring your socks there too! Weekday rate: $16 for unlimited playtime per visit. Weekend / Public Holiday rate: $18 for 2 hours of playtime per visit. $6 for each hour thereafter. Petite Value Pass: $84 for 6 visits (unlimited hours per visit).